Chalet da Colina II is a cozy, family-run property with vintage decor, fully equipped kitchen for preparing a complete meal or a simple breakfast, internet wifi available, central heating, fireplace, oil heater and a beautiful balcony with a Beautiful view of the mountains and a vintage bench for contemplating the two of a beautiful sunset. It can hold up to 4 people, 2 in a beautiful double bed coming from antique on the ground floor, and 2 in the box beds of the sotam which together can form a double bed. WE ARE 4 MINUTES FROM THE TOURIST CENTER CAR. 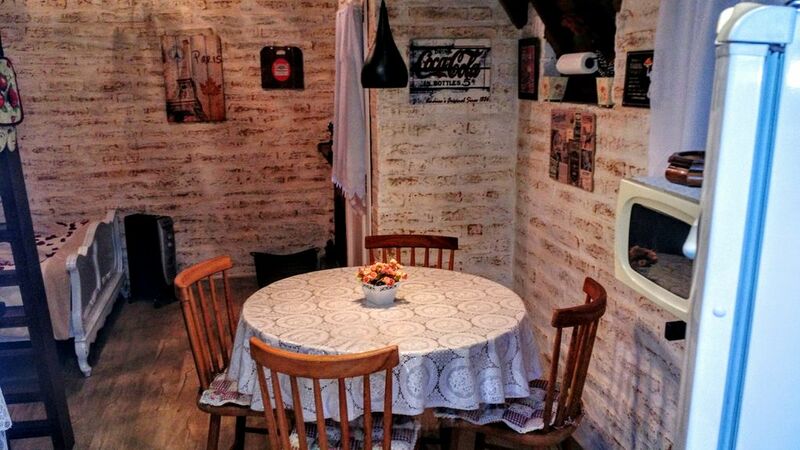 Come and check out this lodging option in a cozy and safe chalet in the mountains of Monte Verde. HEATING GAS AND ELECTRIC CONJUGATES, GLASS BOX SEASONED AND RUSTIC DECORATION. The HOMEMADE HAS 4X4 TOURS BY POINT CITY TOUR (VALUE TO MATCH ON SITE) C / DONIZETE. GREEN HILL IS A VILLAGE TYPICALLY EUROPEAN WITH ALL SHOPPING ATTRACTIONS SPORTS AND ECOTOURISM.